For our letter Y unit, our theme was "Y is for Yardstick" which included the topics of building and measuring. My younger son loves trucks and construction sites, so he was very excited about this unit. We are always trying to find ways to make spelling and reading more fun. One fun sensory activity we did during this unit was writing letters and words in the sand. You can do this at the beach or in a sandbox, or even in the dirt outside. It made it much more exciting when we went outside and created letters that way. We also tried making letters with our Lego blocks as we were building and playing with them. Below are some of the books we read about the theme of building. This is a sweet and simple beginning picture book all about tools. In this cute book, both a doghouse and a regular house are built. My kids enjoyed this cute rhyming book about all the construction machines going to bed. This was a building-themed alphabet with a twist--at the end you see that all the machines have been working together to build an amusement park, and the letter Z is for Zoom. This was one of my son's favorite books. It had simple text and illustrations but he loved it. It was nice to see how all the machines worked together to make a park. We played this cute, free building-themed number order file folder game. We also practiced our math skills by measuring different things around the house. We used a tape measure to measure different items. Then, we also did some measuring with non-standard units such as blocks and toy trains. We got out our toy tool sets and our building blocks and pretended to build cities and "fix" things around our house with our tools. I got builder hats from the dollar store that my kids added to their dress-up collection. We tried to make these crayon-resist blue print drawings. These were a bit tricky for my kids, though, who had a hard time seeing what they were drawing. And our white crayon didn't show very well through the paint. So afterwards, we also made blueprints by drawing with white chalk on blue construction paper. We also made these yardstick Y's. In addition to making the letter Y from brown and yellow foam, we used foam number stickers from the dollar store on the "ruler" part of the letter. We had carrot stick "rulers" for snack time. I also like this idea of making a "cement mixer" smoothie. My husband took my older son to a Lowe's Build and Grow workshop. Every month Lowe's and Home Depot both host free building workshops for kids. My son loved it--he completed a project and even came home with a free apron and patch which he has used as he played pretend afterwards. Together as a family we built a sandbox. The kids went to the store with us to get the supplies, and we included them as much as possible with measuring, sanding, painting, and filling the sandbox with sand. Our sandbox is just a basic wooden frame built from 1 X 12 boards with diagonal supports on the corners, weed-block material stapled on the bottom, and a waterproof tarp cover. It was very fun to work together on this. We sang some of the building-themed songs from this website. For a fun game, we had races to fill up toolboxes with our pretend tools. I also taught my kids how to do a classic wheelbarrow race. And we spent lots of time playing in our new sandbox once we finished it! 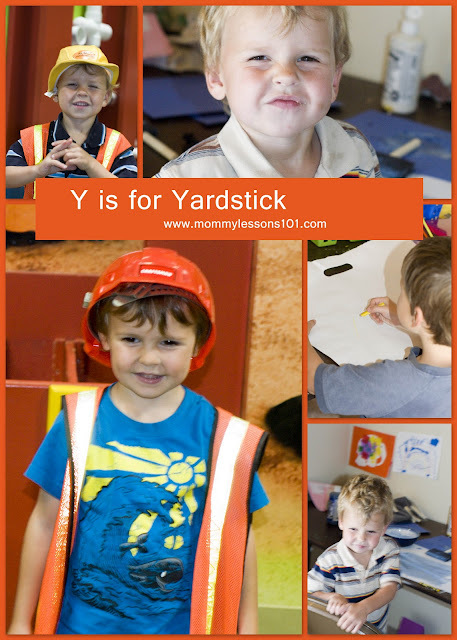 For more of my "Y is for Yardstick" ideas, you can also check out my board on Pinterest! I also did a building-themed birthday party for my three-year-old, so check out my construction party Pinterest board too.